I received the Cricut Bag and Totes in exchange for my review. All opinions are mine alone. 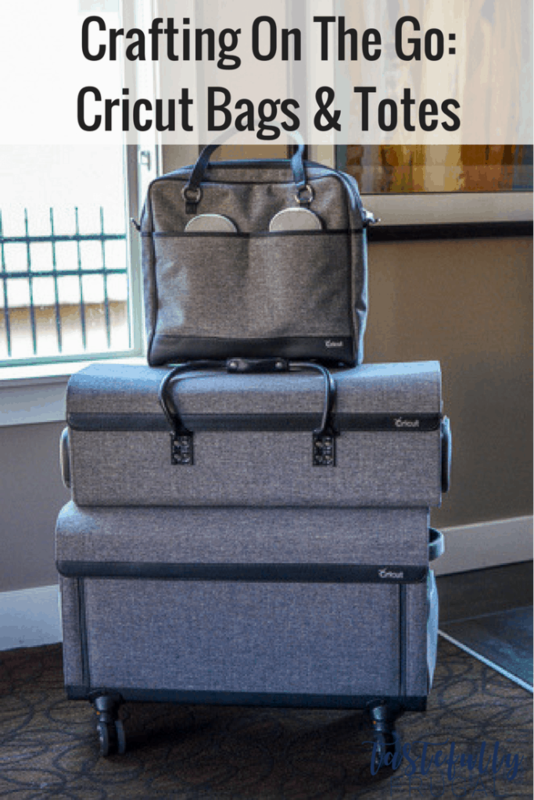 Whether you live in a small house (like me) or like to craft on the go these Cricut totes and bag are the perfect way to keep all your crafting supplies organized and in one place. How many times have you seen those gorgeous craft rooms with wall to wall storage, giant table to craft on and just about every crafting tool you could dream of and think to yourself “Hmm do I ask my husband if I turn our bedroom into this?!”? Come on I can’t be the only one. We moved into our townhouse 3 years ago and it was meant to be a transition from the home we just sold to a new home we had yet decided to buy yet. Knowing we weren’t going to be here long I was OK with giving up our 3rd bedroom for a few months. Fast forward 3 years (and about 3 tons of crafting supplies later) and man do I wish we had that third room. Like a lot of women, I have taken over a part of our master bedroom and deemed it my “craft wall”. While it isn’t ideal it works for now. What doesn’t work is when that craft wall started to spread and our bedroom became a craft room. For a month or two my crafting supplies literally took up every inch of the room except the bed. That had to change. So you can imagine how excited I was (and my husband too) when these totes and bag showed up on our door step. Now I could finally get my crap stuff organized! When I brought the boxes in I couldn’t believe how heavy they were. That had to be a good sign. And it was; these totes are super sturdy yet full of space for just about everything you need. As soon as I got them out of the box I also fell in love with the tweed fabric. It gives my supplies a look of sophistication. Let me tell you about each part and what they are for/hold. 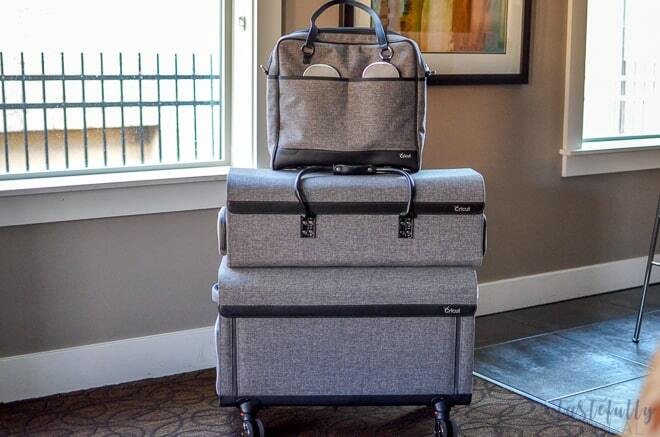 The bottom tote (and the biggest) is the Rolling Craft Tote. This thing is what dreams are made of. There is space for everything from vinyl to card stock, cutting mats and tools even non Cricut supplies like paint and stain (check back later this week to see how I used these at our craft night). 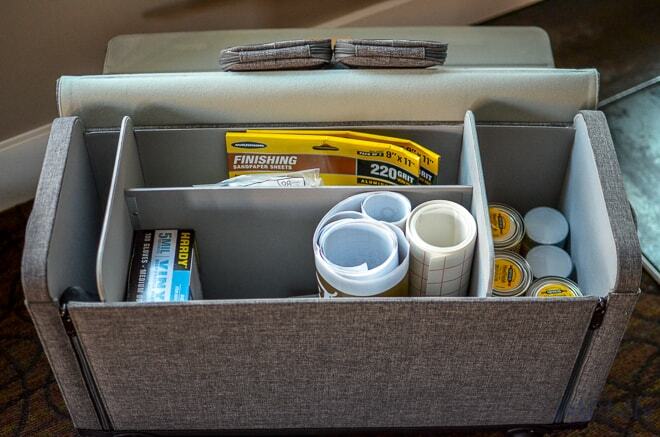 There are 4 sections to store supplies as well as two compartments on the inside of the lid for tools and outside pockets for even more supplies. The wheels are easy to put on and are multi-directional (like IKEA carts) so they move around easily. It also comes with a handle that extends to hold your other tote and bag. Next we have the Machine Tote. 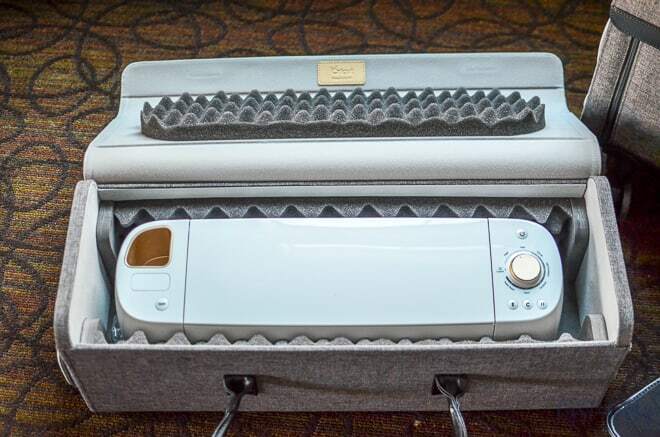 This beauty keeps your Cricut machine safe, secure and dust free. It comes with foam and soft padding to keep your machine extra safe. If you are limited on space like me it’s nice to have a place to put your Cricut when you are doing painting, card making or any other craft where you don’t need your Cricut right then. It also has an elastic sleeve so it slides in the handle of the rolling tote. Lastly we have the Shoulder Bag. This bag can easily double as a briefcase as well since it has a padded section for your laptop and room for documents up to 12×12 (or lots of card stock and cutting mats). On the outside you’ll find two more pockets for pens, tools and more. You can carry it on your shoulder or it has an elastic sleeve, like the machine tote, and fits nicely on top of the other totes. I do crafts on an almost daily basis, a lot of times with my kids and friends, and having everyone up in our bedroom isn’t always ideal. These totes make it so easy to bring the craft supplies down to our family room, kitchen, park or wherever we decide to be creative. Right now these bag are starting at just $29.99 so it’s the perfect time to get organized and start preparing for those holiday craft days we’ll be having with friends soon! Which bag are you most excited about? Thank you for your honest review. I must agree the fabric looks very sophisticated and doubt it won’t go with any interior space! Thanks so much for stopping by Ushmana!